Fresno State University was, until very recently, your prototypical car commuting school. The school began as an isolated agricultural institution and is still connected to a large university farm. Its transportation services haven’t extended much beyond subsidized parking. 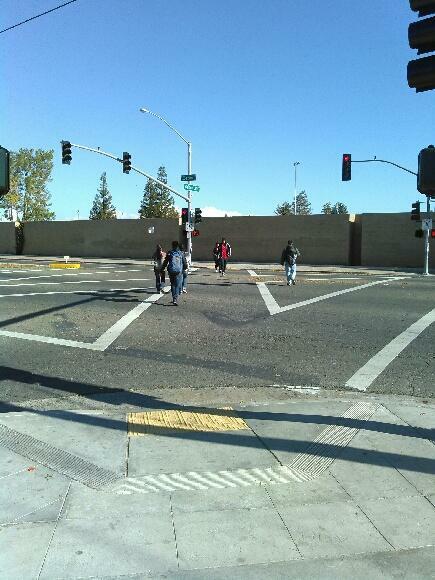 But over time, writes James Sinclair at Streetsblog Network member Stop and Move, the area around Fresno State became more residential. And the university’s transportation systems began to creak under the weight of increasing traffic. Now, Sinclair reports, the university seems to be getting serious about moving beyond the car, and it’s rolling out a respectable Transportation Demand Management program. Also new as of last summer, Fresno State students and staff now have unlimited free access to FAX and the Clovis bus systems! Unfortunately, the walking/biking facilities are poor. Very bad lighting at night, narrow sidewalks, and then an intersection which strongly favors cars. Transit and pedestrians have been covered. What about bikes? Well, the campus has also undertaken a project to install “bicycle barns,” or securing parking facilities for bicycles. 3 have been built in the past year. They complement the skateboard parking dock, which has been by the library for a few years, and looks like this. Curious where many of the maps and statistics in this post came from? They’re all from the Active Transportation Plan, released just this past November. Developed with help from Alta Planning, the plan makes many, many excellent recommendations for improvements to be made on and around campus. More and more colleges are wising up and saving millions of dollars with transportation demand management. It’s exciting to see a place like Fresno State embrace these changes. Elsewhere on the Network today: Transport Providence shares an old clip of Bernie Sanders talking about his parking spot. The Virginia Bicycling Federation gives an update on a bill that would ensure communities that convert car lanes to bike lanes don’t miss out on state road funding. And Kids in the Stairwell offers advice about taking transit with little ones.